TRUTH BE told, I don't feel extra excited for May 1 at all: the End of Internship, the End of Medschool. And it bothers me. Years ago I had imagined these final moments to be extra special: my stomach fluttering with the idea that this, too—this insanity we call medical training—shall end, if only for a few months. I passed by the PGH corridor this morning and saw the countdown board—42 days to go. With a month to go in OB-Gyn and another two weeks in Ortho, plus a couple of days—give or take—for make-up duties (thanks to various instances when I either came in late or did not come to the hospital at all, for valid reasons or otherwise), the End still feels so far away. Meanwhile I slept through most of my time at the Out-Patient Recovery Room. Only one patient was there at a time—a case of inguinal hernia, and was I going to take his BP every 15 minutes when he's had perfectly stable vital signs for the past hour? The airconditioning was soporific, the bench was comfortable, and the nurse, who would later tell me how proud she is of her son (who's graduating from high school this month—congratulations! ), did not mind that I looked like I was on vacation. It felt wonderful. Hands down, it was the perfect pre-duty post. I drifted off to dreamland at 11 am, only to be awakened by invitations to lunch at 12:30. When I woke up, the nurses, all accommodating and understanding, asked me what I was going to do with my life—that is, what specialization I was going to take. The answer to this question still eludes me, and I often answer, “'Yung madali.” My reply can be interpreted in many ways, of course, but my point is that the easiest residency program to take is that which I'm passionate about. What is that exactly? I'll let you know as soon as I know. But it's certainly not going to be OB-Gyn. I have a special fondness for the people in that Department—they're kind, patient, and fun—but I don't see myself doing Cesarean sections and doing prenatal check-ups every day. It's enough that I can do Pap smears confidently. My patients no longer hiss in discomfort when I insert the cold speculum. The trick: lubrication. And reassurance that the procedure is going to be quick—uncomfortable, yes, but not exactly painful. Of course I have no way of knowing. My cervical region is not connected to any uterus. 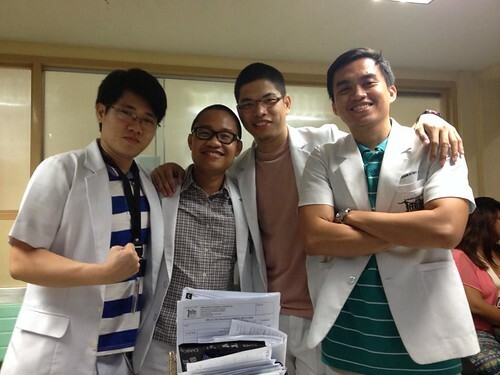 All-male duty team at the OB Admitting Section with Marvyn ("Okay, Marv") Chan, Joseph (Casti) "Pap Smear" Castillo, and Rich ("Wretch") Chy. I have twenty-four hour shifts every three days, and these usually leave me tired the next day. Sleep is often rewarding, and I wake up to post-duty afternoons disoriented as to what day it is. The disorientation can go to a whole new level: I'd be jolted from slumber, thinking I was late for a conference, only to realize that, well, that was for another day. That's classic medschool sleeping pattern, something I will probably miss when I leave the hospital for my board review. But I'd rather go to the beach right now, or maybe visit the lake, with great books, with family and friends who are practically family—but I still have 42 days to go, don't I? I guess med trainees should invest in watches that have the date and day and time clearly showing on the watch face. Now that's a good business idea—watches for doctors.